I woke before sunrise to an unfamiliar sensation: cold. For the first time in weeks, I shivered, and clutched my thin cotton quilt tighter. The soft sand, which had generously radiated heat as I’d drifted off beneath the Milky Way, now reclaimed that lent warmth with interest, sucking it down through layers of camel-malodorous blankets. It wasn’t the chill that roused me, though. I was being tickled. An almost imperceptible pit-a-pat betrayed the furtive scampering of Indian desert jirds — gerbils — scaling the ridges of my limbs as they foraged for chapati crumbs. And as the eastern horizon pinked, washing pale the sky from Egyptian blue to cornflower, and mist pooled in hollows between the dunes, dawn turned up the volume. A delicate scratching announced a dung beetle shaping its sphere of precious ordure. Goat-bells tinkled in the distance. Camels — those inveterate windbags — belched and slobbered. 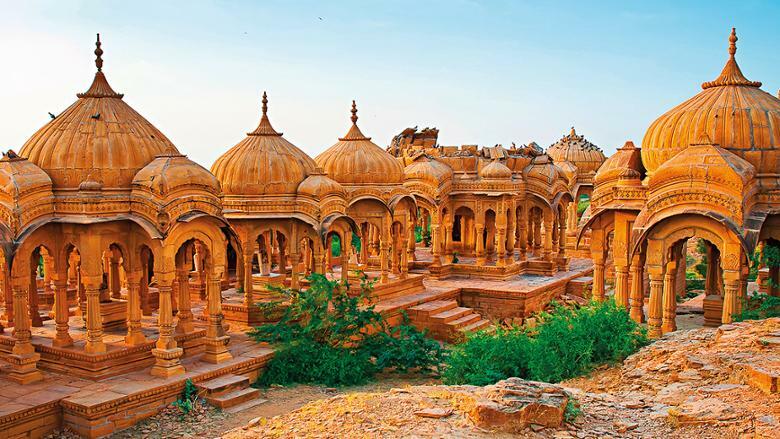 The Thar Desert, stretching west across Rajasthan from the Arabian Nights-calibre fortress of Jaisalmer to the Pakistan border, is a contradictory landscape. It’s searing hot, until it’s cold. Soft sand dunes and jagged rocks, smooth plains and thorny scrub. Dry, wet, dry. Life, and the absence of it. Absent from the ancient maharajas’ cenotaphs at Bada Bagh, and from ghost villages abandoned by Paliwal Brahmins two centuries ago. But not from painted hamlets ringing with childish laughter. Nor the skies where vultures and Indian spotted eagles soar. 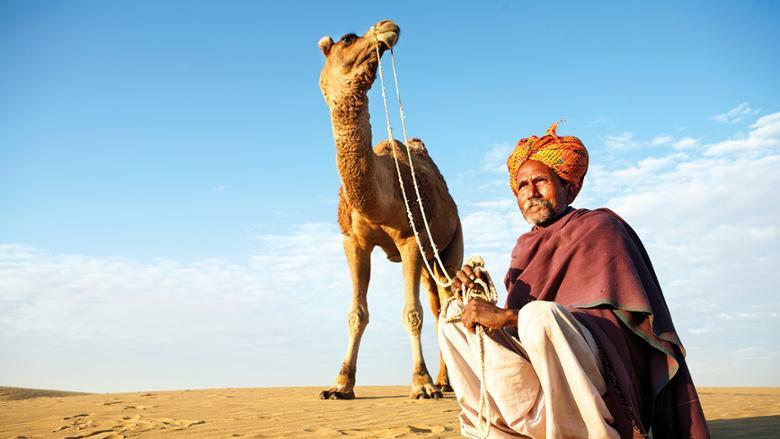 And not from the dunes where at sundown our Rajput camel-drivers, sporting moustaches to humble Hercule Poirot, unsaddled and hobbled their flatulent steeds. One slapped rotis, pleasantly sand-gritty, on a battered metal hotplate over the campfire. His lieutenant conjured a sinuous melody on a double flute; the dromedaries grunted their crude counterpoint. Stars dusted the canopy like icing sugar. For three days, something had been niggling at me. A back-of-brain nagging that refused to budge. Travelling through the thousand-mile-wide Gobi Desert, I surveyed the vista for a sign, when it dawned on me. Back home in the UK, my eyes were accustomed to neat plots of land divided by fences, stone walls and telephone poles. Out here, the landscape galloped free. Unhemmed and boundless, there was nothing to stop a car or horse in any direction and the vastness stretches the mind in new ways. 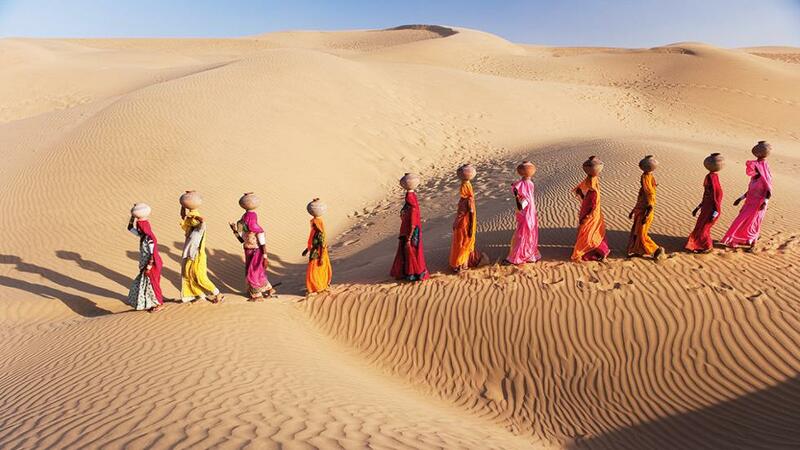 The world’s fifth-largest desert, unusually, offers for the most part bare rock in place of bosomy dunes. She blows hot (35C) and cold (-26C), occasionally with as little as 24 hours’ notice in between, and perched on a plateau 4,920ft above sea level, come winter she wears a coat of frost and scares off suitors with ice-laden sandstorms or snowstorms. I was staying at Erdene Camp — a cluster of a dozen gers (traditional circular Mongolian tents), swaddled in wool and white cotton, and framed against a ruler-straight horizon. 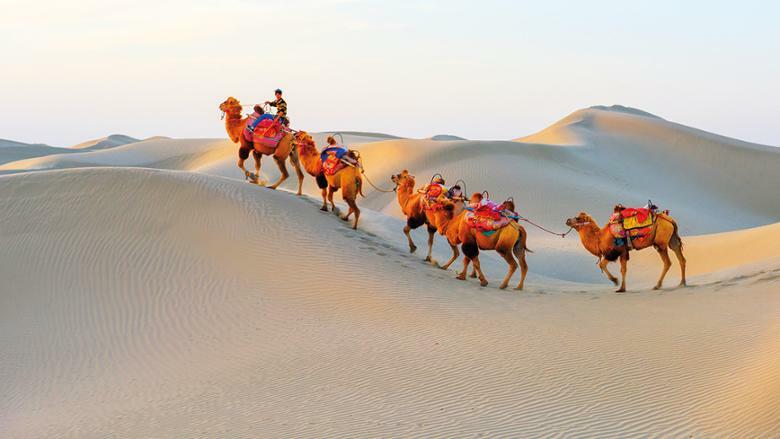 To the west lay the feared Taklamakan Desert that Silk Road travellers and their Bactrian camels strived to avoid. The silence shattered as my boot crunched across the gravel away from camp until the domed gers were mere dimples. The mellow evening cast tones of peach and pale lilac as if a palette of watercolours had been spilt across the sky, fading until the navy night was sprinkled with lustrous stars. The rapidly cooling air made smoke of my warm breath and, sandwiched between rocks ancient and celestial, I felt my smallness. An eight-day Highlights of Mongolia tour from Regent Holidays (regent-holidays.co.uk) starts from about Dh7,000 per person, including full-board accommodation, a stay at Erdene Camp, local transport and entrance fees. International flights not included. 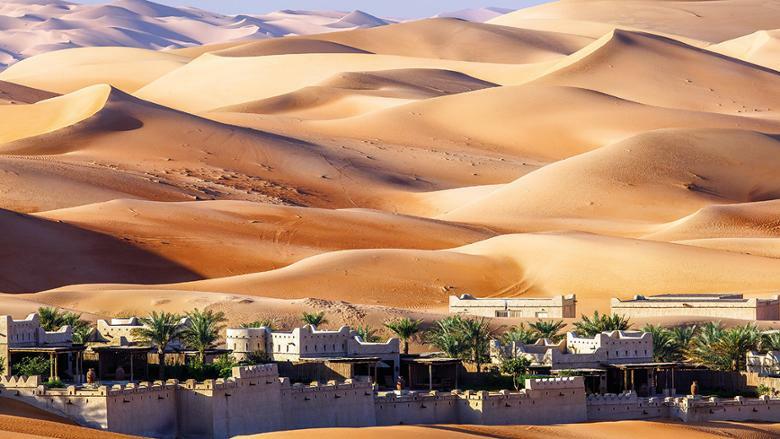 Surrounded on all sides by golden dunes like towering mountains, the Rub’ Al Khali Desert was at once foreign and alien, and yet, to my inner nomad, familiar and hospitable, and we had it all to ourselves. There was no need to set up tents, we would simply sleep out in the open. In the distance, the sun was setting, casting long shadows from the camels like creeping tentacles, and turning the desert a deep blood red. Though named “the Empty Quarter”, there is some evidence of life in the most barren desert, and remarkably we were able to find brushwood to build a small fire by digging up ancient roots. While the camels grazed on dry bits of scrub, we ate slow-roasted chicken with onions and rice, and drank sweet masala chai with fresh oranges for dessert. A thin sliver of moon gradually appeared from behind the dark silhouettes of the dunes and a twinkling of stars emerged from the depths of the heavens. For the first time, I felt completely alone and at peace. I forgot all about home; all about my troubles; all about the past and even what lay unknowingly ahead. There was no phone signal, no internet, nothing to do, just me and my empty thoughts and nothing to disturb them. I finally knew what perfect stillness felt like and I wanted to stay in its embrace a moment longer. My guide began to sing an old Arabian song; the melody of his voice breaking the quiet. I pondered the darkness of the sky and watched as a shooting star darted across its vast dome. It was impossible not to feel transported to another time; one in which material things meant nothing; where the only things that mattered were songs and love. This was the romance of the desert I had longed to encounter. I snuggled up in my sleeping bag to keep off the night chill and, in the desert’s silence, slept until dawn. 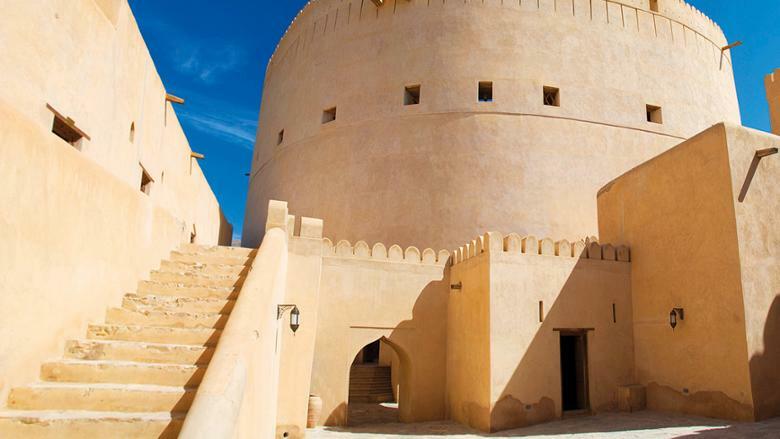 An 11-day Arabian Deserts of Oman tailor-made tour from Wild Frontiers (wildfrontierstravel.com) costs from about Dh13,700 per person, including accommodation, most meals, entrance fees and transfers. Flights not included.